Ponderosa is a friendly, warm, relaxing place to visit for a short vacation. You can use our club's recreational activities in secure and private surroundings. Stay a day, a weekend or the rest of your life. The purpose of the club is to promote health and happiness for its members. 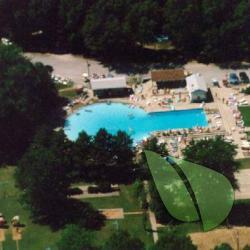 Ponderosa Sun Club is a family oriented nudist resort (not clothing optional) located in rural Roselawn Indiana on 88 wooded acres. Having opened in 1965, the focus of the club's activities is our 65' wide by 120' long swimming pool with concrete sunning apron and formal garden. We are located approximately 50 miles south east of Chicago Illinois, and approximately 70 Miles north of Indianapolis Indiana (2 miles west of Interstate 65 and 1/2 mile north of Route 10). 1. Exit Interstate 65 at the Roselawn/DeMotte, Route 10 exit (mile marker 230) going west toward Roselawn. In two miles you will cross a set of railroad tracks. 2. Turn North (right) on the next road, and proceed one half mile to the gate of Ponderosa Sun Club.